The crew of the starship The Ghost will continue to battle the Empire next fall on Disney XD. Lucasfilm announced today that the hit animated series Star Wars Rebels has been renewed for a fourth season. The announcement was made on the official Star Wars Facebook page. Star Wars Rebels is currently nearing the end of it third season, which has seen some significant shake up to the series. 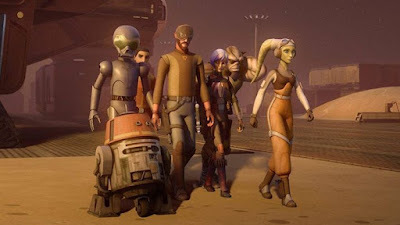 In addition to bringing in fan favourite villain Grand Admiral Thrawn to challenge our heroes, the show also recently featured the departure of the Mandalorian rebel Sabine Wren (though it seems she will still be a recurring character). There had been some speculation that Rebels was perhaps winding down to conclude at the end of Season Three. This partially due to the fact that this renewal came much later than previous seasons, and the reports that a new animated series in the works. Fortunately, we now have at least one more season of adventure with Ezra, Kanan, Hera, Chopper, Zeb, and Sabine. The next episode of Star Wars Rebels, titled "Secret Cargo" airs this Saturday, March 4th at 8:30pm on Disney XD.